explain his disappearance to the court. 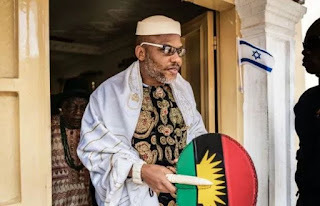 Reacting to an application by one of the sureties, Eyinnaya Abaribe, through his lawyer, Ogechi Ogbonna, that he should be relieved of his role as Mr. Kanu’s surety and that the court withdraws its order for a bond of N100 million, Mrs. Nyako noted that only the appearance of the defendant would prevent a possible forfeiture of the bond. Mr. Kanu was last seen on September 14, months after he was granted conditional bail specifically on April 25 based on health grounds. His lawyer, Ifeanyi Ejiofor, accused the Nigerian Army of invading Mr. Kanu’s residence in Abia State and kidnapping him (Kanu). The allegation was however denied by military spokesperson, John Enenche. Mr. Kanu’s sureties are: Eyinnaya Abaribe, a Jewish priest, Immanuu-El Shalom, and an accountant and Abuja resident, Tochukwu Uchendu.